Vibrant red and golden beet colors will draw your attention to this earthy and flavorful salad. 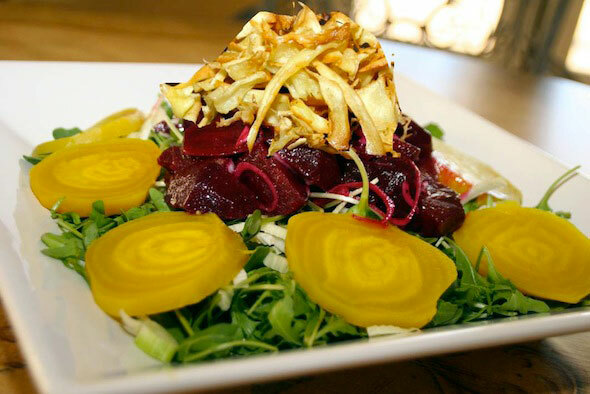 The red beets are roasted then emulsified in a tangy shallot vinaigrette, placed on a bed of complimenting greens, decorated with beautiful golden beet rounds and topped off with crispy parsnip ribbons. If you don’t know what a parsnip is. Let me introduce you. You’ve probably passed right by them in the grocery store, they are usually right next to the carrots which they resemble accept they are a pale yellowish color. They are sweet, slightly spicy and taste wonderful in a number of dishes. To create the ribbons for the salad, use a vegetable peeler to make wide long ribbons. Frying the parsnips intensifies the sweet flavor. This recipe calls for 4 cups because you will probably eat half of them before serving. They are addicting! You also may not be familiar with sunflower greens. I discovered them a month ago and they have become a new favorite. They are the first growth of a sunflower plant, nutty in flavor, loaded with vitamins, and contain a surprisingly large amount of protein! I’m new to Grapeseed Oil which I use in this recipe. It’s a light tasting oil that works great for frying and sautéing. If you don’t have it on hand, use an alternative neutral oil that is safe for high-heat cooking such as safflower, peanut or light olive oil. Medium red beets are roasted and large golden beets are boiled in this recipe for versatile flavors, textures and shapes. Feel free to use any method that you prefer to cook the beets. There are no set rules for the ingredient amounts, the dressing will yield for more greens and if you want to take this salad from delicious to over the top, make the breaded goat cheese (optional). It’s the perfect crisp and creamy touch to this mouthwatering salad! Bitter and nutty greens are topped with emulsified roasted red beets, tender golden beet rounds and crispy parsnip ribbons to make a dramatic salad presentation. If you are feeling extra special, don’t skip out on the breaded goat cheese. It may be the best salad you’ve ever had! Place rack in upper thirds of the oven and set to broil. Rinse and scrub the red beets leaving skins on. Pat dry and place on a large sheet of aluminum foil. Sprinkle the beets with salt and drizzle with olive oil. Fold the foil over them and crimp the sides closed. Roast beets until tender, about 30-45 minutes depending on size. Remove from oven, allow to cool, then peel. Slice in quarters, set aside. Rinse and scrub golden beets leaving the skins on. Place in a medium pot; fill with water to cover beets and add a dash a salt. Bring to a boil, partially covered then reduce to a medium simmer. Cook beets until tender, about 30-45 minutes depending on size. Drain, allow to cool, then peel. Slice into ¼ inch rounds. Set aside. Prepare Dressing: Place shallots, white balsamic vinegar, Dijon mustard, sugar and lemon juice in a medium sized mixing bowl. Whisk in extra virgin olive oil and generously season with salt and pepper to taste. Toss in red beets and set aside to allow flavors to come together. Fry Parsnips: Line a large baking sheet or dish with 2 layers of paper towel. Heat ½ cup grapeseed in a large heavy non-stick frying pan until oil starts to sizzle. Working in batches, carefully drop handfuls of the parsnip ribbons into the oil over moderately high heat, stirring occasionally with a wooden spoon until ribbons deepen in color and start to crisp, about 2-3 minutes. Transfer parsnips to the paper towels and cool. Add additional oil if needed between batches if needed. Optional: Prepare and Pan Fry Goat Cheese: Line a baking tray with parchment paper. Sprinkle both sides of goat cheese rounds with salt and pepper. Dip the goat cheese rounds, one at a time into the egg mixture, letting the excess drip back into the bowl, then roll in the bread crumbs to fully coat both sides and place side by side on baking tray. Cover and place in the freezer for about 15 minutes or until ready to use. Using same fry pan that was used for parsnips, add additional grapeseed oil if needed to coat the pan. Heat oil to a simmer, carefully place the goat cheese rounds in the pan and fry on medium-high heat until lightly browned and crisp, about 2-3 minutes per side. Drain on paper towels. Assemble Salad: Toss arugula and fennel in a large serving dish/platter (shape of your choice.) Top with sunflower greens. Using a slotted spoon, transfer red beets and shallots from dressing mixture and stack in the center of the salad. Place golden beet slices all around the salad mixture. Top with desired amount of fried parsnips. If using breaded goat cheese, serve desired amount to surround each individual salad plate. Serve with remaining dressing (from red beet mixture) on the side to pass around.